add groups and buttons to the built-in Word ribbon tabs. It is common for our clients to add buttons for their most commonly used templates to the front of Word’s Home tab. You might set the buttons in a drop-list format to save screen space. remove groups from the built-in Word tabs. It is common for our clients to remove the built-in Styles group from the Home tab and replace it with something specific to their Style setup. 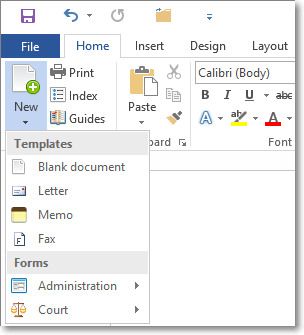 display a cascading drop-list or fly-out of all folders, subfolders and files within a given starting folder. the tooltip that displays when the mouse hovers over the button.